From Grindleford you need the turn off the B6521 for the B6001 Hathersage, you then need the immediate left turn up Sir William Hill road, follow this for around 1.5 km till the road turns to the left, you'll see a roughly surfaced road by this turn in front of you, park up by the bottom of this road. From here follow the rough road up hill for around half a kilometre where you'll find a sign posted access point onto the moor to your right, access the moor and just follow the path for around 3/4 km, after passing two quarry pits, one either side, the path rises slightly then drops down quite steeply, the cairn where the cup marked stone sits should be visible some 200 metres down the path on the right. Please be aware there are several quarry pits in the area with the largest 20 metres to the right of the path on the high point of the moor. 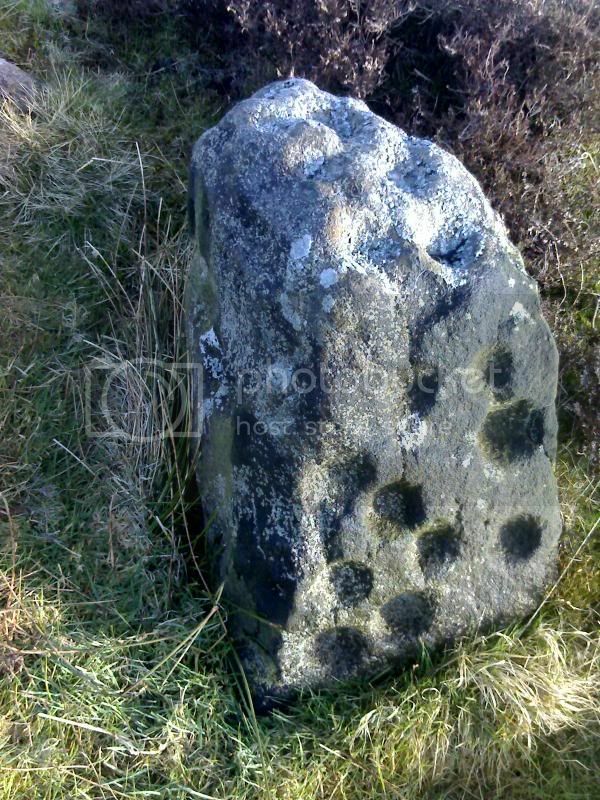 Sporting around 20 golf ball sized cup marks this has to be one of the finest examples of rock art in Derbyshire and is well worth the effort of the short walk to it. The stone itself sits atop a cairn measuring a respectable 18 x 15 metres, though much vandalised due to stone robbing the cairn is a worthy site in itself and was thought to be a flat topped kerbed design, it currently stands around a metre above the surrounding land. Close by, some 30 metres NNW lays another stone bearing 10 probable cup marks though this can be hard to locate due to the dense undergrowth.